GIGABYTE is well known for their overclocking and gamng motherboards, but are far lesser known for their work in workstation products. 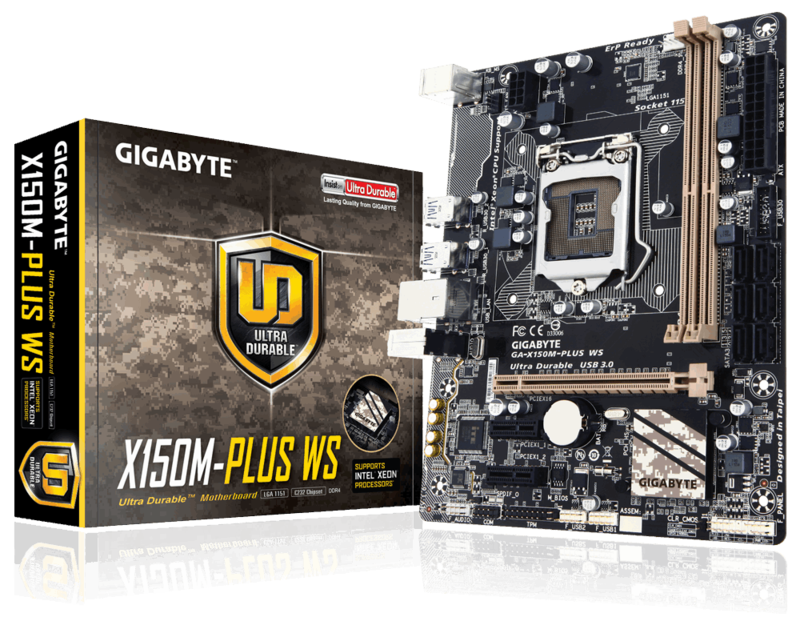 To change that, GIGABYTE has announced two new workstation focused motherboards at CES 2016 that will begin to show PC enthusiasts some of the work they've been doing in that space, but in a more accessible package for the mass market. 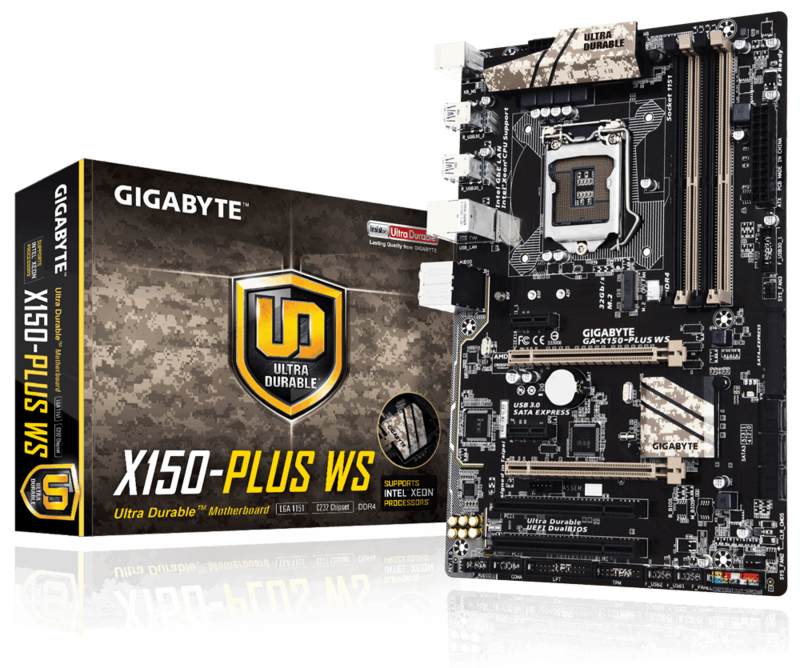 GIGABYTE is launching an ATX form factor version called the GA-X150-PLUS WS and an mATX version called the GA-X150M-PLUS WS. Both boards will feature support for Intel® Xeon® E3-1200 v5 processors on the LGA1151 socket and feature onboard PCIe Gen3 x4 M.2 connectors and Intel® GbE LAN port with the cFosSpeed Internet Accelerator Software to eliminate lag. The X150-PLUS WS will feature 2-Way graphics support with x16 PCIe lanes coming directly from the processor, and four DIMM slots to support DDR4 memory. The smaller GA-X150M-PLUS WS iwill have a single x16 direct PCIe lane from the processor, and dual channel DDR4 memory support. GIGABYTE also announced the GA-X170-Extreme ECC, which are one of few boards to directly support ECC (Error-Correcting Code) Memory, and is built for 24/7 operation in mission critical environments. On top of that, you'll get the usual USB3.0 ports and SATA3 Connectivity and select versions of the board will even support Intel vPro, which provides encrypted Wireless Communication, security features, remote management and more. Of course, GIGABYTE proven features such as DualBIOS™ technology and the GIGABYTE APP Center will also be part of all boards announced at CES 2016. The GIGABYTE BRIX series of Mini-PCs also receive an update. Most notably, the new systems now feature the new Intel® 6th Gen. Core™ processors and feature Intel HD Graphics 520. The systems will continue to support a variety of different configurations with either an Intel® Core™ i3/i5/i7 processor onboard, with choices of support for a 2.5” SSD or HDD storage. They are also equipped with an M.2 slot for additional SSD support and the systems continue to be packed with USB3.0 ports, with support for HDMI and DisplayPort, allowing support for up to three displays. Hardwired ethernet is provided by Intel Gigabit LAN. The most exciting thing about the BRIX is the addition of Intel® Thunderbolt™ 3, available over a USB Type-C™ connector. Features such as Power Delivery 2.0 for fast charging of external devices, daisy chaining of up to 6 devices, and support for DisplayPort 1.2 will provide support for 4K displays and more. This connection will be available on the GB-BSi7T-6500 and the GB-BSi5T-6200 models only. Expect these new products to be rolling out right after CES 2016 with pricing information coming soon. Full press release below. At CES 2016, GIGABYTE will be unveiling for the first time its GIGABYTE BRIX™ models with support for Intel® Thunderbolt™ 3. Thunderbolt™ 3, which is available over a USB Type-C™ connector, brings an unprecedented single-wire bandwidth of up to 40 Gb/s -- twice more than the previous generation – and a variety of other revolutionary features such as Power Delivery 2.0 for fast charging of external devices, daisy chaining of up to 6 devices and with support for DisplayPort 1.2 capable of handling 4K monitors. Thunderbolt™ 3 will be featured on the new GB-BSi7T-6500 and the GB-BSi5T-6200.